A rather odd one, this. In 1969, the Football League introduced a rule which sought to avoid sock-clashes. For many teams, that meant wearing away socks with the home shirt and shorts when necessary, as Everton did, for instance. 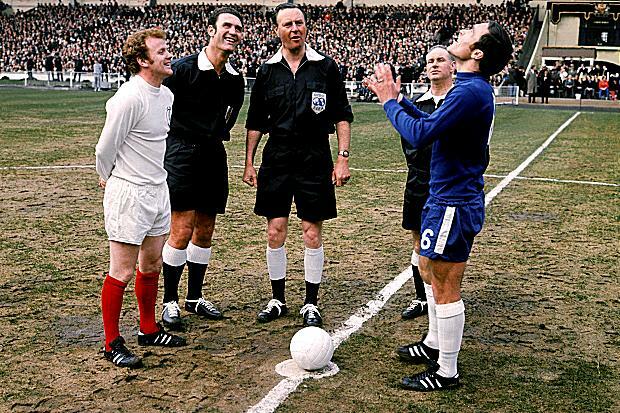 It seems weird to think now, but Leeds United’s away kit at the time was all-red and in the 1970 FA Cup final they wore the socks from that kit. Very un-Leeds-like, you’ll surely agree. When Leeds reverted to an all-yellow away, they began to wear that at Maine Road, a practice which became commonplace for nearly all away games as their relationship with Admiral grew throughout the 70s and marketing opportunities were capitalised upon. As far as we’re aware, they haven’t worn white shirt away to Manchester City since the 1970s, but, as always, we’re open to correction. Serves me right for only looking up (relatively) recent league games! 67-68 Leeds wore the white with dark blue shorts. Just before they started turning up in red shorts.